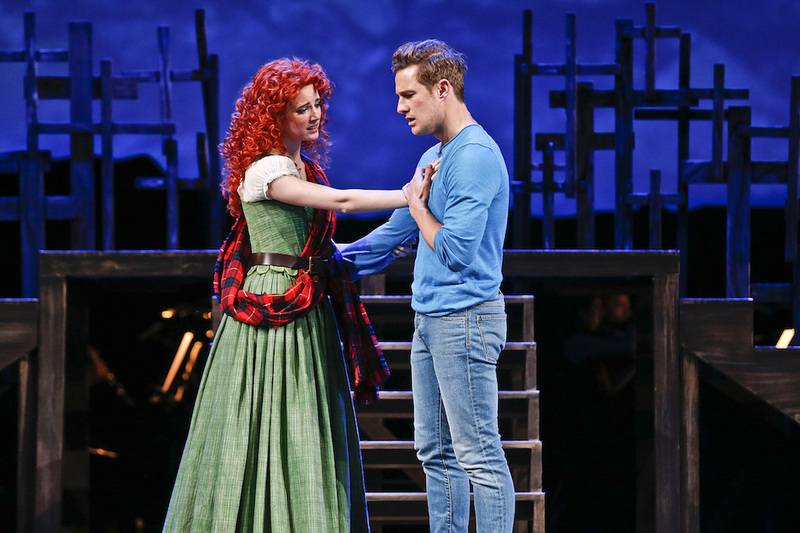 An intelligent update and a terrific cast make Brigadoon an immensely satisfying offering from The Production Company. 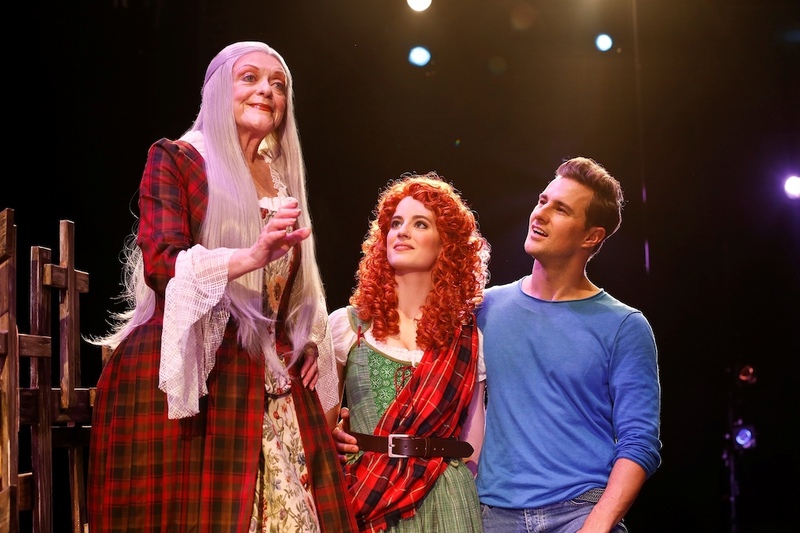 Crafted in a form we now take for granted, Brigadoon’s origin came at the dawn of Broadway’s golden age, when the seamless weaving of story, song and dance was as exciting and innovative as Hamilton is today. Much credit for the success of Brigadoon has been attributed to Agnes de Mille, choreographer of the original 1947 production, whose dances enhanced characters and added dramatic depth. 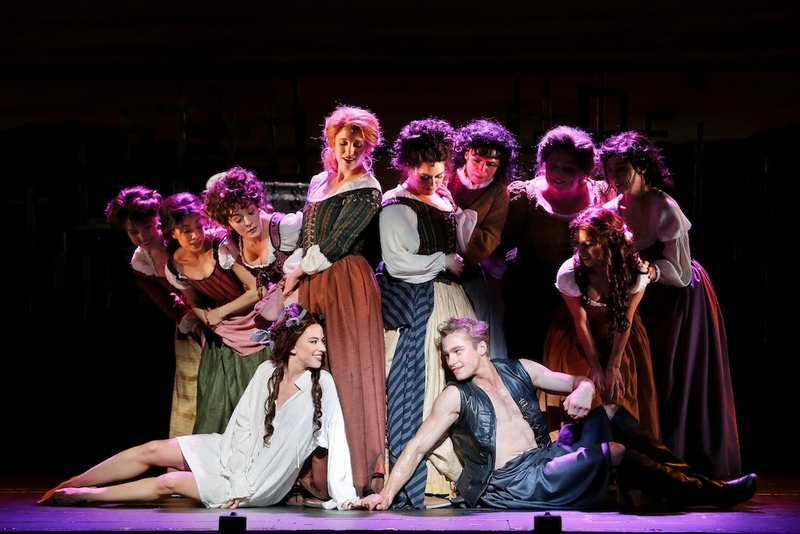 This production encapsulates the very best of what makes The Production Company such a treasured asset in the Melbourne musical theatre landscape: the re-enlivening of an all too rarely seen classic show, and the perfect blend of established talent with up-and-coming stars of tomorrow. In only his second engagement at The Production Company, director Jason Langley shows what can be achieved with a carefully considered update that respects the show and aligns strongly with the original authors’ intentions. Brigadoon is customarily updated to begin in the year in which it is produced, and Langley has capitalised on 1717’s contrast with 2017 technology and political correctness, also using the present day for a deliberately jarring return to the glitzy yet superficial reality of modern New York. Alterations within the main body of the libretto are where Langley really makes his mark. Sexist attitudes are retained, yet partially softened by changing the parent of Fiona and Jean from Mr to Mrs MacLaren. In another change of gender, having Mrs Forsythe explain the “miracle” created by her husband, who died in the process, adds a sentimentality beyond just having fellow elder Mr Lundie explain the backstory. In a moment of high drama at the wedding celebration, Langley has troubled youth Harry not just kiss the bride but also violently strike her. This shocking action adds to the audience’s attitude towards Harry, whose death now occurs violently in full view rather than off stage. As well making these tweaks to Lerner’s book, Langley is also to be highly commended for achieving such a deft balance of genuine comedy, poignant romance and affecting sorrow. 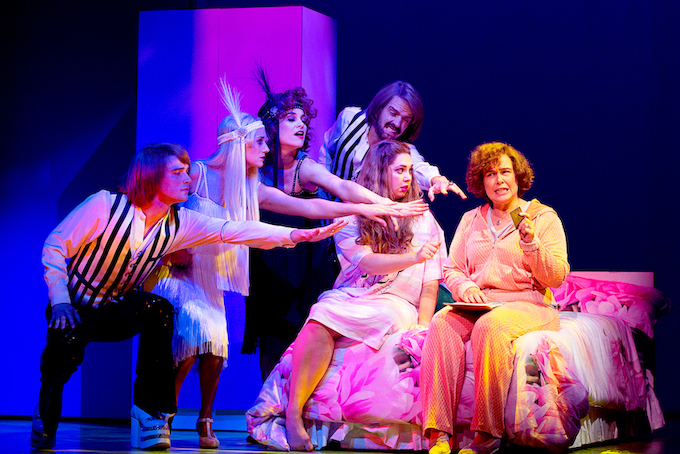 Any potential corniness or melodrama in the 70-year old musical are neatly sidestepped. While the staging corresponds to previous presentations, with minimal scenery and the orchestra on stage, Langley has worked with his creative team to present a fresh and interesting appearance. Positioned well upstage, the orchestra disappears into the silhouetted hillside when not playing. Projections on a downstage scrim curtain add to the magic as the town of Brigadoon appears and disappears. 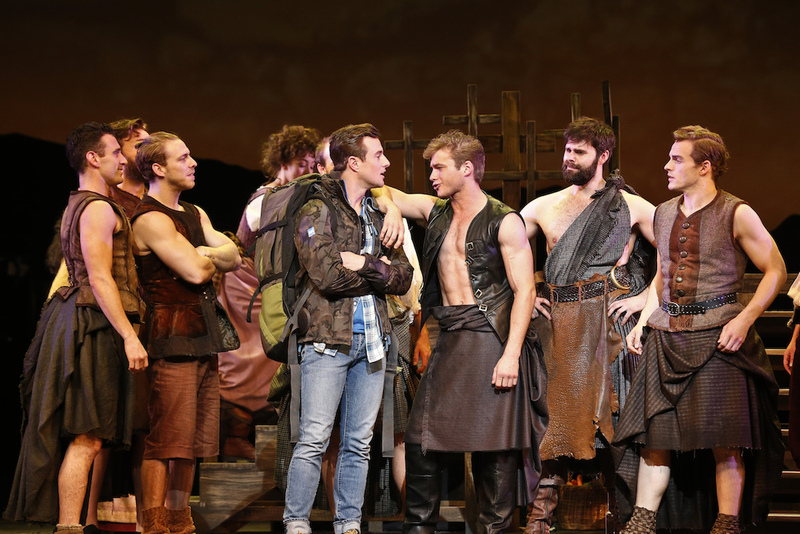 Lighting designer Matt Scott contributes significantly to the magic and beauty of the staging. 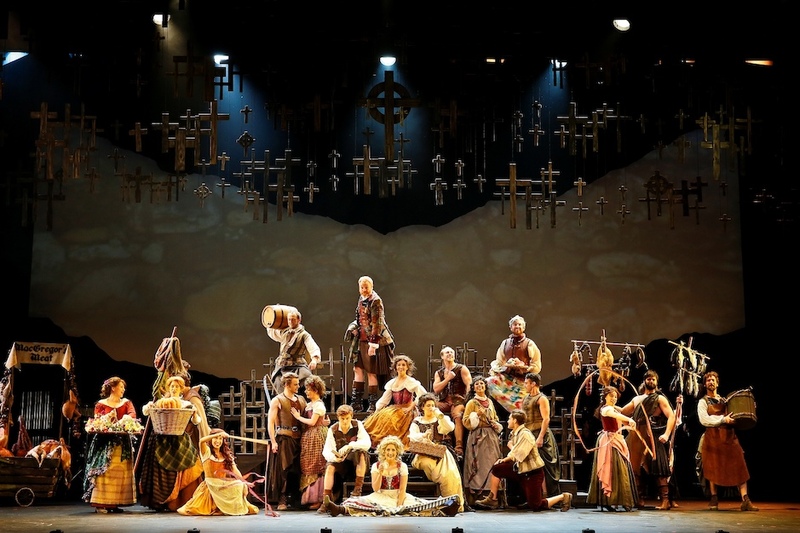 Set designer Christina Smith gives the staging a tactile texture, with dozens of cemetery crosses floating overhead and also attached to the central multi-purpose platform unit. The rear stage wall features a relatively simple yet visually striking combination of scrim framed by lower and upper panels that conjure landscapes and horizons. Completing the visual appeal are the wonderfully layered costumes by Isaac Lummis. Using a creative range of fabrics and furs, Lummis distinguishes each member of the cast. Trent Whitmore’s wigs complete the characterful styling. The wedding features the town’s best tartans, and although this has not been used to denote clans, it is a gorgeous pageant nonetheless. To achieve an audience-friendly running time of 140 minutes (including interval), the show zips along with zesty energy. Musical director Michael Tyack keeps tempi brisk and lively, enhancing the appeal of Lerner and Loewe’s charming score for modern ears. Loewe’s music sounds glorious as played by the 21 musicians of The Production Company Orchestra. 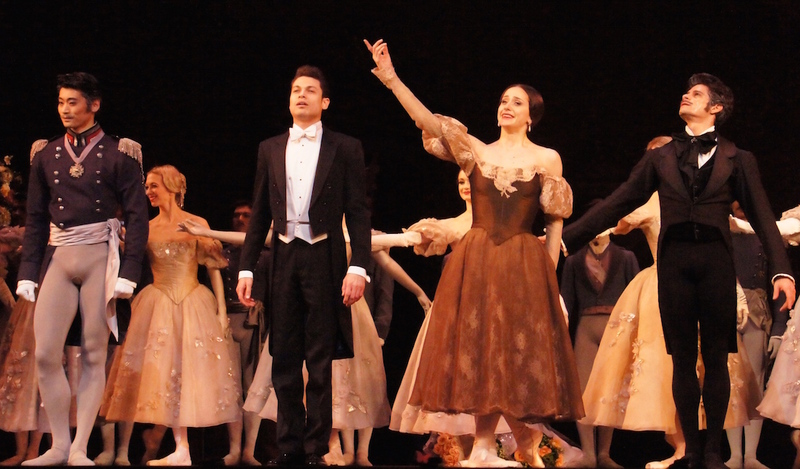 While the majority of the audience will not notice that some of de Mille’s dances are trimmed or excised, it is a shame that the triangle between Harry, Maggie and Charlie is lost. Impressive sequences that are retained by choreographer Cameron Mitchell include the bold Sword Dance at the wedding and Maggie’s mournful Funeral Dance. 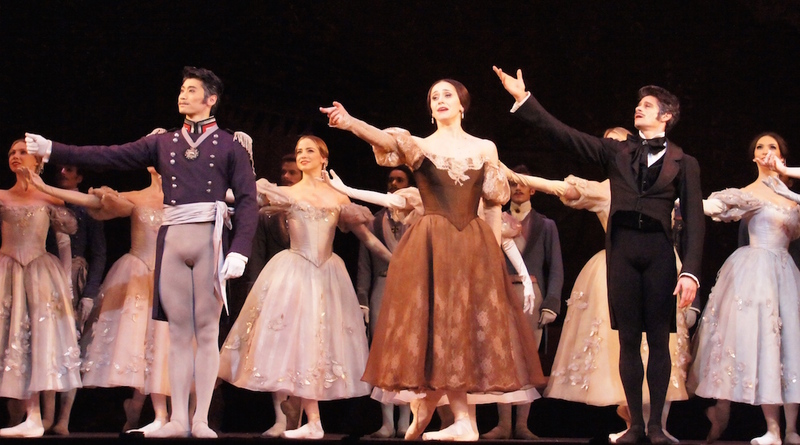 Choreography throughout the production is joyful, energetic and well integrated. Fresh from his starring role in the Australian tour of Singin’ in the Rain, Rohan Browne clearly demonstrates the strides he has taken in cementing his position as one of Australia’s top triple-threat leading men of the musical theatre stage. Browne brings fresh appeal to Tommy, convincingly conveying his swift rebirth from disillusioned New Yorker to passionate lover. Mitchell plays up Browne’s dance ability by adding light-footed choreography for Tommy. Browne sings Tommy’s romantic ballads with gentle flair, moving naturally from speaking to singing. Young soprano Genevieve Kingsford is a delight as Fiona, her soaring voice perfectly suited to the gorgeous songs. Enjoying charming chemistry with Browne, Kingsford is just as convincing in portraying how Fiona quickly falls in love. Kingsford’s portrayal of Fiona’s sorrow secures the emotional heart of the show, and her performance will surely win her many new fans. As Tommy’s wisecracking friend Jeff, Luke Joslin is in top form, landing all the laughs with finely honed comic timing. Recent Helpmann Award-winner Elise McCann makes an auspicious and long awaited TPC debut as saucy maiden Meg, a clear counterpart to Oklahoma!’s Ado Annie. McCann brings out all the humour in the role, but the most exciting aspect of her performance is her sensational singing, taking “The Love of My Life” and “My Mother’s Wedding Day” well beyond being merely comic numbers. A pair of very recent musical theatre newcomers are given well deserved exposure in Brigadoon. 2016 WAAPA graduate Matthew Manahan continues the sensational form he showed in the title role in Paris. From his first entrance as bright-eyed bridegroom Charlie, Manahan raises the stage energy considerably, performing with enthusiastic, yet well-disciplined, verve. Manahan’s tenor voice soars through ballads “Go Home with Bonnie Jean” and “Come To Me, Bend To Me,” reflecting the exciting stage future he has ahead of him. Joel Granger, who graduated WAAPA a year earlier, takes a dramatic detour from the charming characters he played in Melbourne independent productions Titanic and Ordinary Days. Granger commits himself to Harry’s stormy, sullen countenance, landing the physical action scenes with gravitas. Stefanie Jones is reliably delightful as eager young bride Jean. Given only a snippet to sing, Jones displays her willowy elegance in Jean’s expressive dancing. Experienced performers Stephen Hall (Mr Ritchie) and Sally Bourne (Mrs MacLaren) bring characterful presence and palpable warmth to their roles. Living legend Nancye Hayes shines in a role that befits her revered status, playing Mrs Forsythe, the wisest elder in the town. 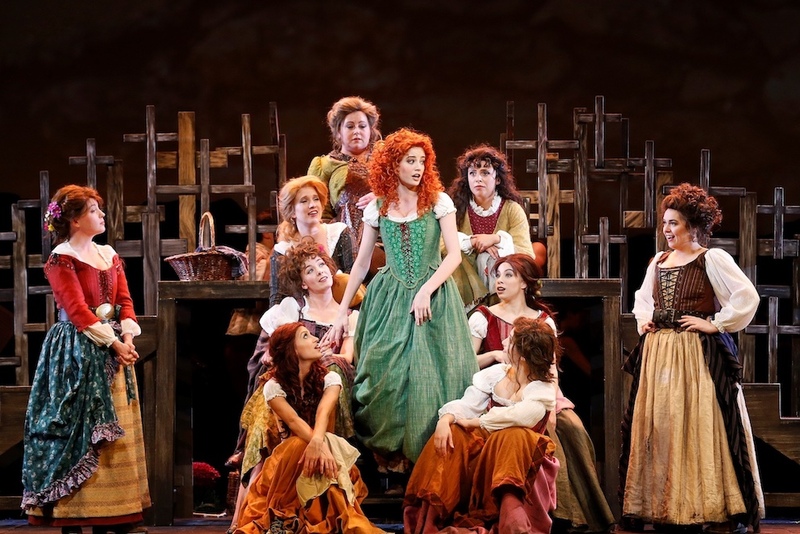 While the season’s success will largely depend on the appeal held by golden age gems, musical theatre audiences are very strongly encouraged to embrace this wonderful production of Brigadoon. 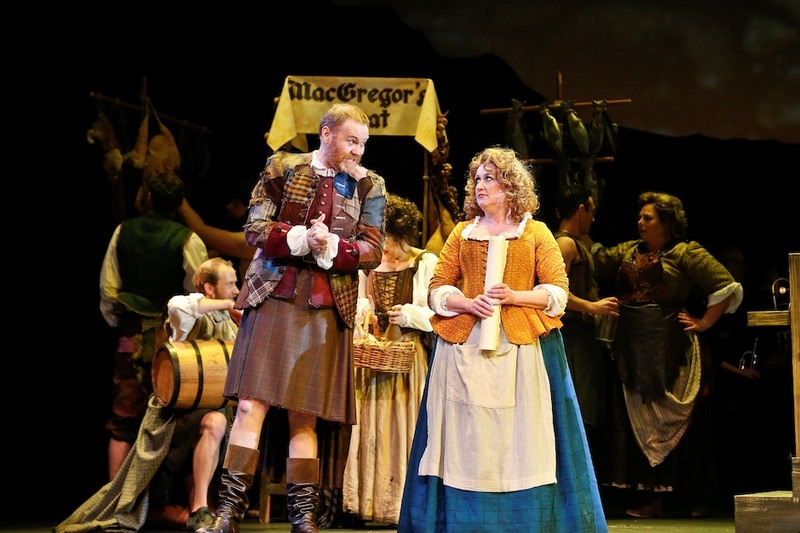 Brigadoon plays at State Theatre, Arts Centre Melbourne until 5 November 2017. An outstanding review (knowledgeable, perceptive and nuanced) of an excellent production. Simon has perfectly described this intelligent update of a finely crafted 1947 classic musical. Thanks very much for your kind words, Rob. Glad to hear that you have had the chance to enjoy this production as well. I am hoping to go along again this week. Simon, a very accurate and thorough review. Thanks very much, Daryl. Glad to have your company on Saturday evening. Looking forward to our own collaboration on Brigadoon next year.